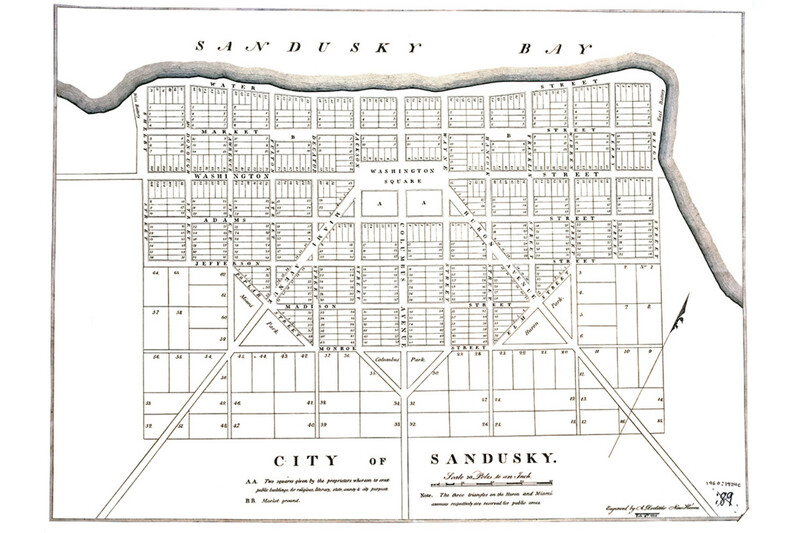 In 1817, James Kilbourne met Isaac Mills and Zalmon Wildman, the owners of the land where Sandusky now stands, and convinced them to pool their resources in order to establish a new city on the south shore of Sandusky Bay. Kilbourne was an entrepreneur, an Episcopal minister, and a surveyor who founded the city of Worthington, including its Masonic Lodge, and many other Ohio towns. Kilbourne, Mills, and Wildman hired Kilbourne’s son, Hector Kilbourne, to lay out and survey the town which Kilbourne suggested be named the “City of Sandusky.” Hector completed the survey of Sandusky in 1818 and the town plat was published in by the famous Connecticut engraver, Amos Doolittle. Hector Kilbourne, who, like his father, was a Freemason, imposed the square and compass of the Masonic Emblem on the rectangular grid of the new town, an arrangement that continues to confuse visitors to this day. Washington Square, located in the heart of the city, was reserved for “market ground” and for the erection of “public buildings for religious, literacy, state, county and city purposes.” Three additional parks were set aside at the points of the Masonic emblem. The streets running east and west beginning with Washington Street were named after the first five U.S. Presidents. Those running north and south with the exception of Columbus Avenue were named for prominent figures of the Revolution and War of 1812. At the time, Water Street ran along the shore of Sandusky Bay, but the area was filled in in later years allowing for the construction of railroad lines and present day Shoreline Drive.